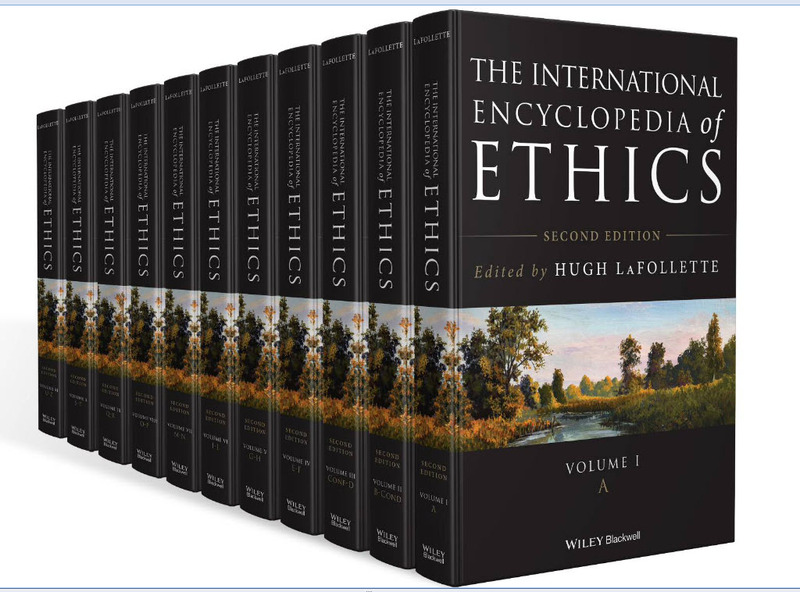 The International Encyclopedia of Ethics is the most comprehensive, authoritative print and electronic Ethics resource available. Its entries discuss topics, movements, arguments, and figures in Normative Ethics, Metaethics, and Practical Ethics. It covers major philosophical and religious traditions; entries are wriitten by nearly 700 different highly respected thinkers from around the world. In its electronic form, each entry is hyperlinked to other entries and to electronic editions of the renowned Blackwell Companions and Guides (see here) ― in all, more than 1500 scholarly articles. The electronic version will be regularly updated, making IEE the preferred resource for any professional, layperson, or student wanting to know more about Ethics. The print edition is 9 volumes of more than three million words. Work on the Encyclopedia is shepherded by an Editor-in-Chief and three Associate Editors. The first electronic update was published in June 2015 and each June since. Combined the first five updates will have nearly 110 brand new—and nearly 140 revised—entries. New and Revised Entries are specifically identified on the "Authors" and "Topics" pages..
"The International Encyclopedia of Ethics is sure to become a core resource in the field. . . . Over nine volumes, the encyclopedia addresses the themes, eras, influential people, and theories related to ethics. . . . Each entry has embedded cross-referencing within the article, a complete cross-reference list at the end of the article, references, and further readings. Additionally, there is a highly detailed index at the end of volume 9, making this resource extremely accessible. . . . The review process of each entry—each article was vetted by a rigorous blind peer-review process—makes for an authoritative source in ethics . . . This set is highly recommended for libraries in higher education. . . . It will be particularly useful for undergraduate students, graduate students, and scholars, who will likely find it to be an invaluable resource." "This will be a welcome additiion to electronic or Print reference collections in libraries of all sizes." (Reference and User Services Association): "Honorable Mention" in competition for the Best Reference Work (all disciplines) for 2013. "An enterprise like this sets out to be comprehensive, authoritative and contemporary, to lay out the content in a coherent and user-friendly way, to set up intelligent cross-references between entries that authentically reflect overlaps and distinctions between definitions and methods, to capture the international flavour of ethics and its associations with culture and philosophy and morality and to connect everything up to the rich and challenging historiography and bibliography in all these areas. No small task, then, and it is achieved well in this impressive work. . . . This reviewer has had the pleasure of working with it on several weeks now – using it for research and lecturing as well as with student projects and reference work. Its strengths come through time and time again, in many ways and at various levels of inquiry." (Reference Reviews). The principal UK journal with reviews of reference works.